Letting go is never easy, but when the faithful at Holy Spirit Parish in Sharon Hill celebrated the last Sunday Mass at the church at 11:30 a.m. Jan. 11, they did it in grand style. The Delaware County parish had consolidated into nearby St. George Parish in Glenolden last July. 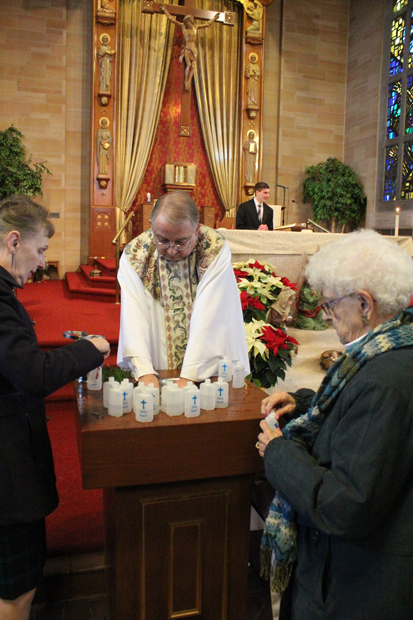 Because it was the Solemnity of the Baptism of the Lord, water from the Holy Spirit baptismal font was blessed, poured into vials and given to the parishioners. After Mass the congregation proceeded by bus and cars to St. George Church, where the people poured the blessed water into St. George’s font and a baptismal ceremony for two children took place. The baptism not only welcomed new members into the body of Christ but also symbolized the welcoming of the life-long Catholics from Holy Spirit. Holy Spirit was founded in 1892 on land donated by the Holy Child Sisters. It was never a large parish but it did have a great history. Originally carved from territory of St. Clement Parish in Paschalville (Southwest Philadelphia), its greatest claim to fame is that it was the birth and childhood parish of the late Cardinal John Foley (1935-2011). The current Holy Spirit Church, beautifully appointed, has an unusual feature: President John F. Kennedy is depicted in one of its windows not for personal sanctity but because he happened to be inaugurated as America’s first Catholic president in 1961, the year the church was dedicated. As with so many wonderful parishes, over time the congregation dwindled and at the time of the consolidation last summer there were only about 200 worshipers weekly. As a worship site of St. George with one Sunday Mass, that number dwindled to about 80 and most recently to about 60, according to Father Leo Oswald, pastor of St. George. “There is regret and sadness, but not anger,” he said. 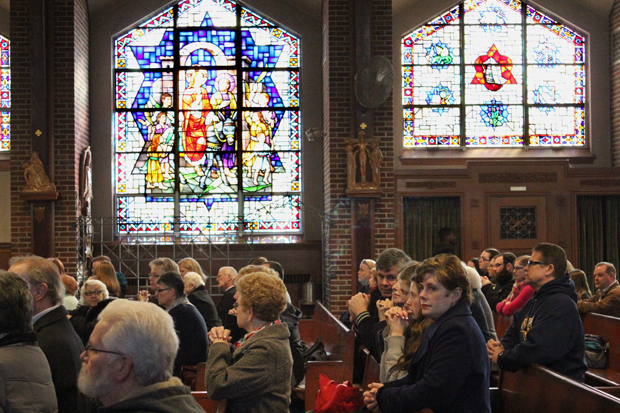 The matter was discussed at length by the transition team drawn from the two parishes and the decision was made to discontinue the Sunday Masses at the former Holy Spirit. The three possible dates discussed were the First Sunday in Advent which began the liturgical year, the First Sunday in Ordinary Time (Jan. 11) and Palm Sunday. The 11th was chosen because the solemnity marked the baptism of Jesus, a symbolic time to celebrate a new birth. The two communities are blending, and the infusion of new people has been good for St. George because they have added to the vibrancy of the ministries, Father Oswald believes. The transition was not really difficult for Marie Dunleavy, who was a life-long parishioner at Holy Spirit who now works part-time at St. George, mainly because two of her children and her grandchildren were already members of St. George. Patty Scirrotto, who is director of liturgy and music at St. George, believes the parish is benefiting from receiving the Holy Spirit parishioners because many of them have become active at St. George in the choir and the other ministries. Also, Holy Spirit had many elderly parishioners and now their needs are being met through the outreach programs at St. George.